4Teachers.org database allows you to select a subject, a theme and then a specific topic. ABC Teach - Database of thematic units. Activity Search - from Houghton Mifflin Harcourt "Education Place". Alabama Learning Exchange - Lessons categorized by subject and grade levels. Awesome Library - various subjects included in this database of lesson plans. Curriki - Open source educational materials with a focus is on K-12 curricula materials in the areas of literacy mathematics, science, technology, language arts, and foreign languages. Discovery Education A lesson plan library for K - 12. Education World's Lesson Planning Center. Education World's Teacher Submitted Lesson Plans Collection. 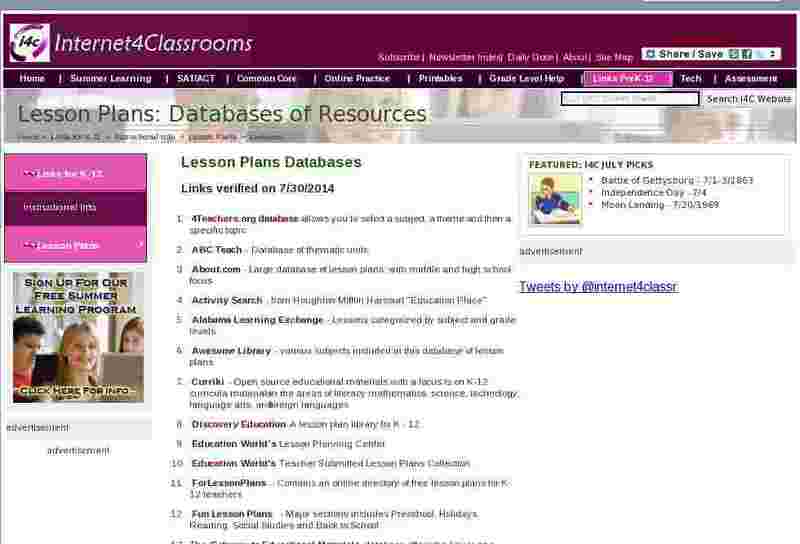 ForLessonPlans - Contains an online directory of free lesson plans for K-12 teachers. Fun Lesson Plans - Major sections includes Preschool, Holidays, Reading, Social Studies and Back to School. Lesson Plan Search - over 2000 lessons in this database, but few on each page. Lesson Plans Page - Over 2,000 free lessons. Math Archives K-12 Teaching Materials. Math Forum Lesson Plans - Organized by topic or grade level K - 12. Microsoft - Contains a huge lesson plan library organized by grade and subject. Monthly Themes from Houghton Mifflin Harcourt "Education Place"
Primary Resources - Lesson plans, activity ideas and resources for primary and elementary school teachers. Quia Index - Quia users have created activities in the following topics. These activities have been created by Quia's subscribers and are of varying quality. Smithsonian Education - Lesson plans emphasizing inquiry-based learning using primary sources and museum collections. TeachNet.com - Large database of lessons, cross-curricular emphasis. Utah Education Network - Large lesson plan database, organized by subject and grade level. WNET Database - Original lesson plans are developed by Thirteen Ed Online Master Teachers. Starting with tried-and-true lessons that work in the classroom, our Web-savvy teachers have built Web-based activities that use the rich resources of Thirteen/WNET New York and the Internet.